2-3 hour tour from Klaki base camp during summer, and 3-5 hours from Húsafell during winter. Please notice that departure in this tour is from Husafell or Klaki at Langjokull Glacier’s edge. You will need your own car to drive to the glacier where the tour starts. Tour in a specially modified glacier vehicle on Langjokull glacier. Departure from either Husafell or Klaki base camp by the glacier’s edge. English speaking driver / guide / audio guidance. Free WiFi in glacier vehicles. 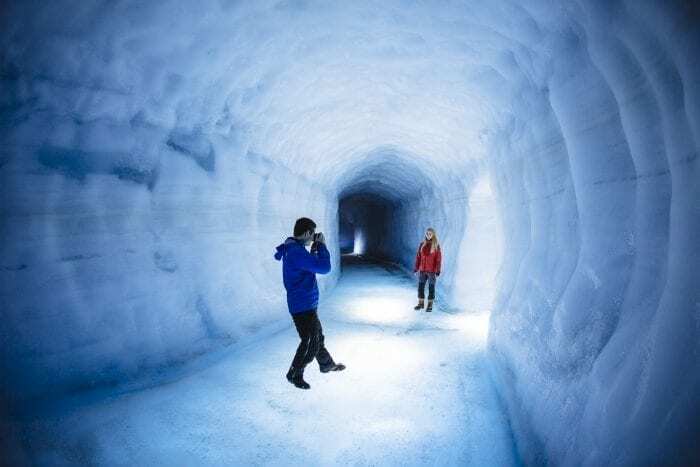 Your Into The Glacier Adventure is truly a unique experience. You will get the opportunity of a life time to enjoy one of the world’s greatest wilderness; Iceland’s second largest glacier – from the inside! 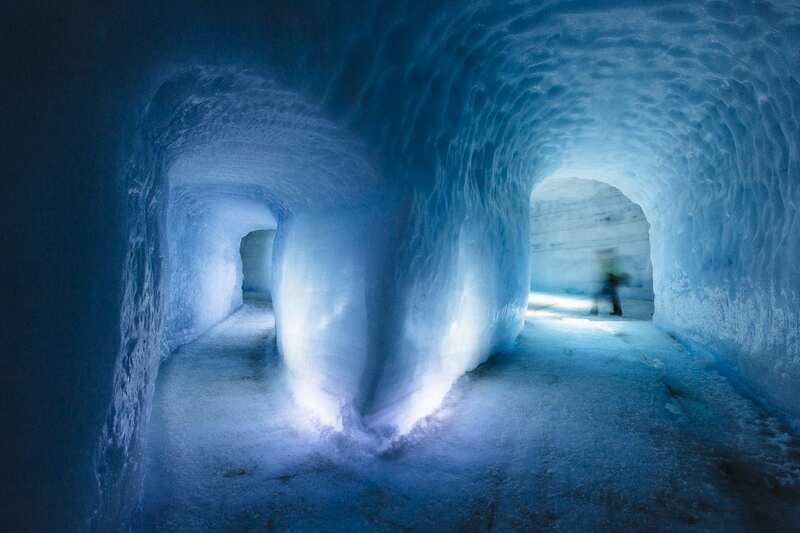 Never before the Langjokull ice tunnels, has anyone been able to see the beautiful blue ice at the heart of an ice cap glacier. 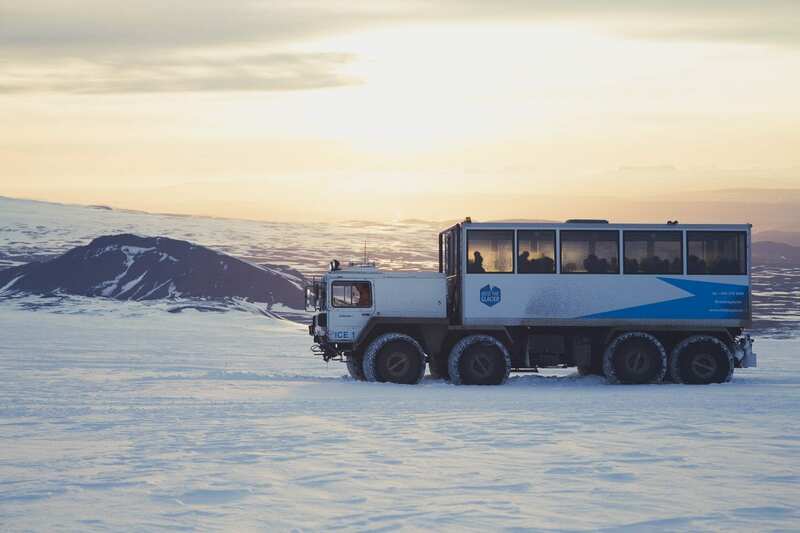 You’ll get to drive in a specially modified snow truck on the glacier, explore the glacier environment, enjoy a view out of this world and go INTO the glacier to experience the glacier’s beauty from the inside! 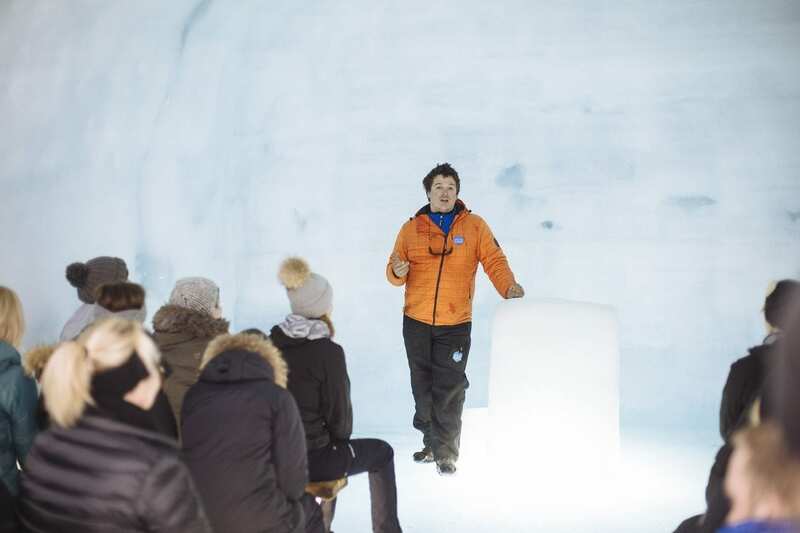 An experienced guide will lead the way the whole time to make sure everyone is enjoying themselves to the fullest.It´s time to take ice cap glacier exploration to a whole new level. Dive in. Welcome on board! 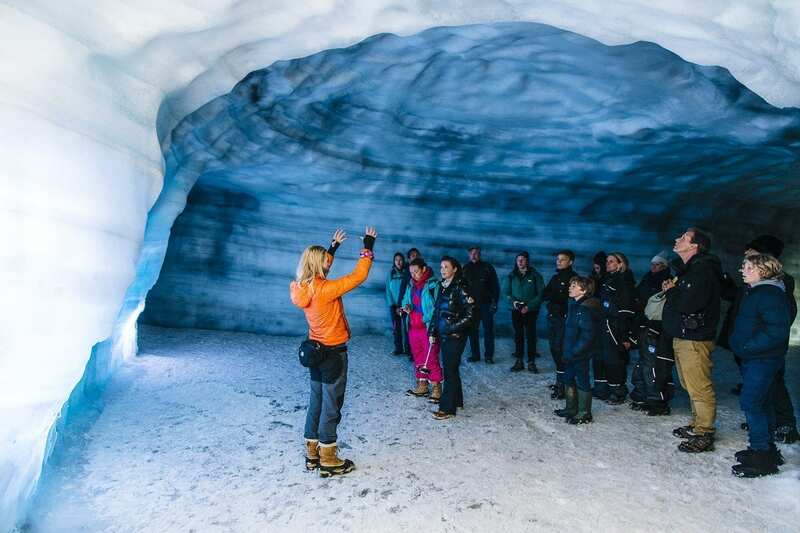 Book Your Into The Glacier Adventure now. Warm clothes, including a waterproof / warm coat and suitable footwear (even in summer). The meeting point is Húsafell center and all tours depart from there. When driving from Reykjavik please give yourself at least 2 hours to reach Húsafell and check in 30 minutes before your tour. During summer schedule, 1st of June to 15th of October. Please note that road 550, leading to Klaki base camp, is a rough gravel road, only suitable for 4×4 vehicles. If you do not have a 4×4 vehicle, we strongly recommend booking the shuttle service from Húsafell. The shuttle ride takes approximately 30 minutes and costs 2.000 ISK per adult guest for the round trip. The price for teenagers, age 12-15, is 1000 ISK and free for children, age 0-11. The tour departs from Klaki base camp approximately 40 minutes after the scheduled departure time from Húsafell. Please note that these departure times are an approximate as they are dependent on the arrival of the shuttle transfer from Húsafell. Driving directions to Klaki base camp from Húsafell. Continue driving on road #518 and make a right turn to road #550 at the intersection right after you have driven out of the small forest. Drive on road #550 for about 20 minutes, before you make a left turn towards Klaki base camp. You will see a sign that reads Langjökull as well as an Into the Glacier logo. After about 10 minute drive you will reach Klaki base camp. When driving from Reykjavik please give yourself at least 2,5 hours to reach Klaki basecamp and check in 30 minutes before your tour.